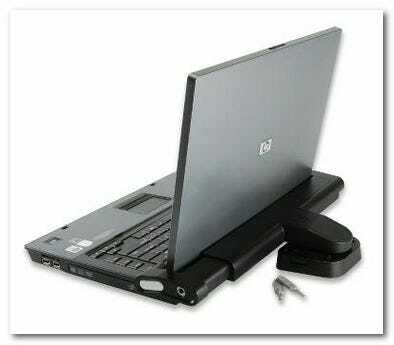 Historically laptops included a slot in the side for attaching security cables–as seen in the photo here–but increasingly more slender laptops like ultrabooks are omitting the lock-slot from their case design. How do you properly secure a laptop without one? My company is planning to buy several laptops for demonstration purposes in a convention stand. 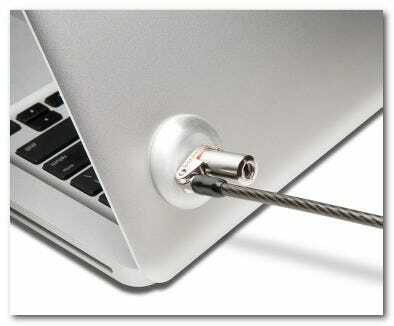 Previously, we always bought laptops that have Kensington slots for the typical cable locks. Now, the laptop we are liking most is an ultrabook with no Kensington slot, and we are looking for a mechanism that does not need the slot. How can they secure the laptop without a traditional lock-slot? That they sell here: Security Slot Adapter Kit for Ultrabook™ and at the time of this post, it seems reasonably priced at $12.99 US.